Norman Birdwell, Creator of "Clifford The Big Red Dog" Dead at 86 from The Martha's Vineyard Times. Peek: "In 1962 Mr. Bridwell found himself having to support a wife and infant daughter on extra money he picked up doing freelance artwork. He considered supplementing his income by illustrating picture books." 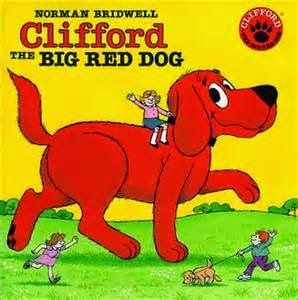 "Clifford The Big Red Dog" Creator Norman Bridwell Has Died by Carolyn Kellogg from The L.A. Times. Peek: "The first Clifford book was published in 1963. All told, there are more than 129 million copies of the many Clifford books in print in 13 languages. The character was also been the basis of an Emmy-award winning animated television show on PBS." Obituary: Norman Bridwell by Shannon Maughan from Publishers Weekly. Peek: "Bridwell’s famous pup, introduced in 1963, was originally going to be called Tiny. But the author’s wife, Norma, suggested that the dog be named after her own childhood imaginary friend, Clifford." See also Norman Bridwell Papers from de Grummond Children's Literature Collection at The University of Southern Mississippi.